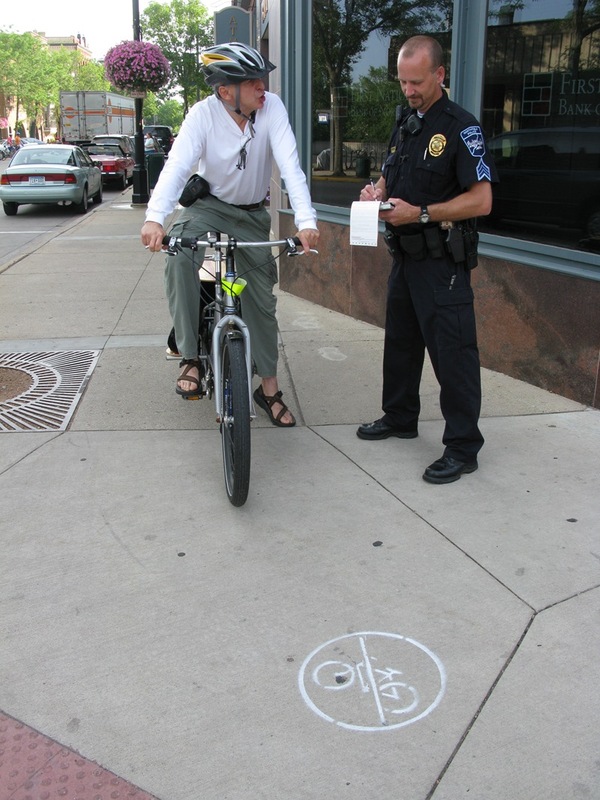 Left: Yesterday afternoon NHS Executive Director and blogger Hayes Scriven messaged me a photo of the new ‘no biking’ stencils painted on sidewalks all over downtown this week. Center: Queen of the Triumvirate Tracy Davis tweeted the photo of the stencil on the sidewalk in front of Rare Pair. Right: I was riding my bike around downtown this morning taking photos for a blog post about all this when I got busted for, um, riding my bike on the sidewalk. Unlike last month’s citation, I didn’t swear. See Ross, I’m learning. Aren’t you exempt because your bike isn’t exactly like the one in the stencil? I mean, it looks like one of those extended bikes, with the long platform over the rear wheel. 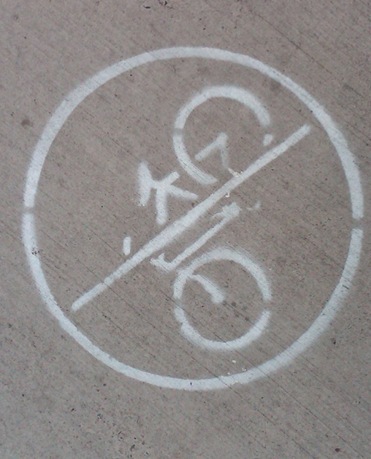 Not at all the bike depicted in the stencil. I’d appeal. Griff, if this keeps up you will be barred from both motorized and non-motorized transport. As for the bike not being like the one in the stencil, could we argue we are not stick figures as shown in other signs around town? Hey, wait just a dan tootin minute. 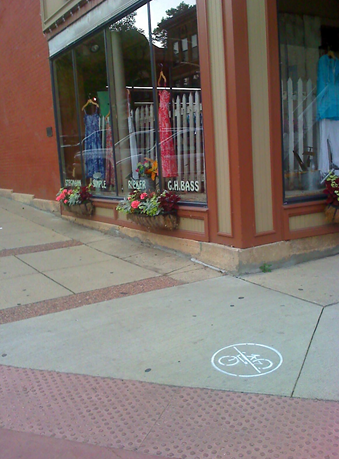 I thought we were trying to clean up the graffiti in downtown Northfield. Now we have city sanctioned taggers running about? Looks like the police are trying to get the Griff-iti off the street, I mean sidewalks, too. I think Griff is on Eric Johnson’s Big Dummy cargo bike. I saw Eric there shortly after the picture was taken. Now we know: only big dummies ride on downtown sidewalks! I just thought of something. Do street pedalers have to collect sales tax, and are they required to have a special permit? John, are you implying that one needs a permit to be special? Bright- It depends on what they specialize in.